(June 1, 2018) — Partners in Research, a program that brings together scientists and science-minded members of the community, supports early stage ideas that have the potential to transform scientists’ understanding of medicine. At a recent research showcase, Partners in Research grant recipients told funders how their awards have helped them push their science forward. In its last awards cycle, Partners in Research funded seven projects. Researchers representing each project spoke at the May 15 event at the Residence of the Swiss ambassador in Washington, D.C.
Riggins previously received an award from Partners in Research in 2012. With her training in breast cancer, Riggins was working with a graduate student when she found that her work may have implications for patients with glioblastoma, an aggressive type of brain tumor with few treatment options. 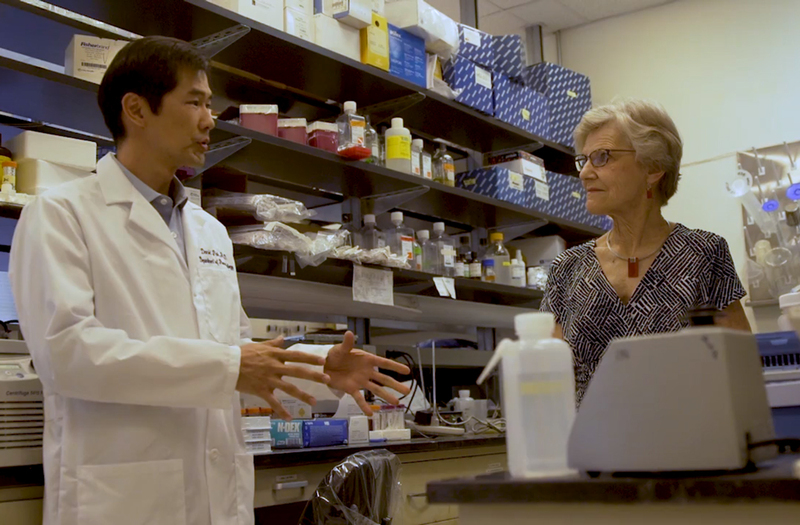 With the 2017 Research Breakthrough Award, she has been working to develop a model to see whether a drug targeting a specific hormone receptor can work inside the brain to help glioblastoma patients. A recent publication in Scientific Reports featuring research from Riggins’ lab acknowledged Partners in Research. Thanks to Partners in Research, Ghazaul Dezfuli, PhD, a researcher studying obesity, was able to pursue an idea that had been lingering in the back of her mind. “I was very, very pleased and very, very thankful for the support of Partners,” she added. Gholam Motamedi, MD, professor of neurology, used his award from Partners in Research to study whether brain stimulation can “reshape the brain networks to treat insomnia” and other conditions. Before connecting with Partners in Research, Motamedi spent 10 years trying to identify potential funders to support his research idea. Receiving support from Partners in Research allowed Friedman to collaborate. “What I’ve been able to do with the Partners money is join with a colleague of mine who is more experienced in a different type of technique which involves brain stimulation, a thing I never could have done by myself, and together we are doing this pilot study,” she said. With the grant from Partners in Research, Joanna Kitlinska, PhD, associate professor in biochemistry, and molecular and cellular biology, and Sonia de Assis, PhD, assistant professor of oncology, collaborated on research to identify risk factors for the development of neuroendocrine tumors in babies and young children. Specifically, they studied the impact of stress in fathers before conception on cancer development in their future children. Since receiving an award from Partners in Research, Valeria Avdoshina, PhD, assistant professor in neuroscience, has developed a drug to prevent HIV-associated neurodegeneration that may also have implications for Parkinson’s disease, Alzheimer’s disease and more. Avdoshina thanked Partners in Research for funding high-risk, high reward research. “We are so excited and it definitely wouldn’t have happened without your support,” she said.